Get ready to mark your calendars, because you won’t want to miss this. Soon, people all across the nation will have a chance to experience a piece of American history that might otherwise be out of reach. Arlington National Cemetery is taking to the road, and it just might be coming to your town! 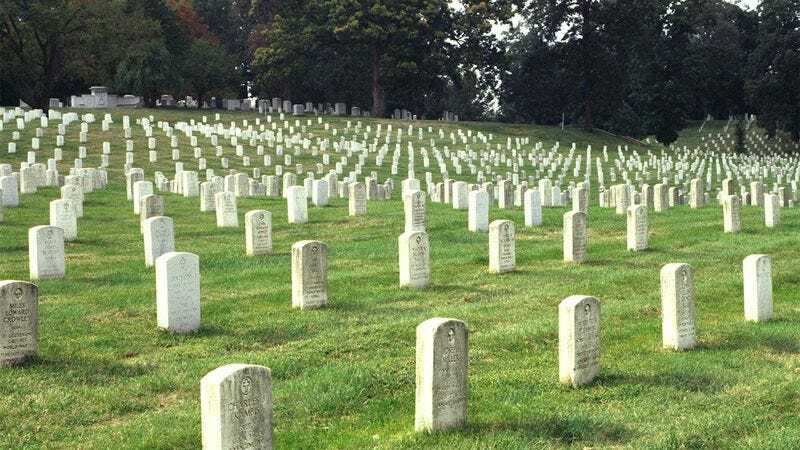 Residents from Dallas to Detroit will be able to visit the cemetery and pay their respects at hallowed landmarks including the USS Maine Memorial, JFK’s eternal flame, and the graves of over 400,000 American servicemen. The tour is scheduled to make 50 (!!!) stops on its U.S. tour, culminating in a week-long exhibition at New York’s Madison Square Garden. In addition to the main events, organizers have arranged special programming at many of the tour stops. Visitors in San Francisco will be treated to “Don’t Worry, Baby”—a late-night event at the U.S. Coast Guard Memorial set to the music of the Beach Boys. Throughout the month of May, visitors in Wisconsin will have a chance to see a special changing of the guard ceremony featuring current and former players from the Milwaukee Brewers. Then, once the U.S. tour is complete, the whole event is going overseas for six months, so thousands in Europe and Asia will have the chance to honor the fallen before they’re returned to their permanent resting place in Virginia. What an incredible chance to connect with our nation’s heritage! Whether it’s your first time visiting Arlington National Cemetery or you see it every year, this definitely looks like something worth checking out. Count us in!